What does your software actually do, Mr Salesman? Buying an informatics system for your laboratory? Don’t worry about LIMS, ELNs and so on, go for a STMSBAGMETR, says Gloria Metrick. 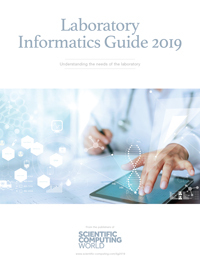 The two most significant laboratory informatics products, LIMS and ELNs, are continuing to merge into something that becomes yet more difficult to separate. So we us not try to separate them, but rather let us determine what we actually need from software and go find something that meets those requirements. What do all these acronyms mean -- LIMS, ELN, SDMS, LES? –? Do you know? I am an expert and I am sometimes not sure that I do. Over time, we have added more acronyms and redefined what each of them means to the point that they sometimes appear to be randomly used in whatever manner a software vendor’s marketing department sees fit to use them. We also have too many theoretical discussions about what these acronyms mean, discussions that might help those of us having the discussion separate the terms, but that do not help anyone else to standardise on their use. With that said, let me attempt to explain what these terms are ‘supposed’ to mean. A LIMS (Laboratory Data Management System) manages samples, tests, and results. Basically, it should allow management or supervisors to see how much progress is being made on the work, to assign work, and to better understand the properties of the samples being analysed. However, anyone who has worked with a LIMS knows that a real-life sample is not the same thing as a LIMS sample. For one example, we often use a LIMS to manage stability pulls. These are not ‘samples,’ but we insist on calling them that in LIMS. When we manage instrument calibration standards, these become LIMS samples or tests. In real-life, they are neither. So, we have moved away from what we think is the definition of a LIMS in terms of what the products offer. To muddy the waters even further, LIMS products are now offering what we might consider ELN features. An ELN (Electronic Laboratory Notebook) is supposed to be experiment-based. Some might insist that an ELN can refer to only a software package intended for a research laboratory, but others would say that an ELN is a more general category, i.e., that any laboratory can benefit from an ELN. However, there are many different software packages to address the needs of research and development versus quality control. So already, we have a problem with the definition, as you can tell. In addition, some people claim that an ELN replaces the paper notebook, while others argue that if you replace a paper system with an electronic system, you are doing yourself a disservice. They are not equal and should not be treated as such. Furthermore, just as LIMS are offering ELN-like features, ELNs are now offering LIMS-like features. An LES (Laboratory Execution System) is the QC (quality control) laboratory’s version of an ELN. It has specifically relevant functionality, such as that for method execution, where the system forces a specific workflow for a method. Should an LES really just be called ‘an ELN for the QC lab’ or does it deserve its own category? It is hard to say. Certainly, no one thinks an LES would be appropriate for a research lab (well, I am hoping they do not think that! ), but some products called ‘ELNs’ are appropriate for the QC laboratory. The term LES was conceived to denote a product as specifically for the QC lab, but it is not always used in that context. An SDMS (Scientific Data Management System) manages scientific data. I tend to think of it as something that, at the least, keeps track of the instrument data files so they can be easily found and tied to the instruments and products they should be tied to. However, SDMS is not used often enough to determine whether there is general consensus on its meaning; it often refers to one particular software product on the market. The outcome is that we spend too much time discussing these theoretical acronyms and what they supposedly mean. Let us get rid of these acronyms, once and for all. Let us force the sales people to tell us what the focus of the software is supposed to be. As I said at the outset, there has been a trend for some time for the distinction between LIMS and ELNs to become blurred and this is continuing. So it is pointless to try to separate them. Let us determine what we need from software and go find something that meets those requirements. Then, the next time you call up a software vendor, ask them for ‘something that manages samples but also gives me test results.’ Unfortunately, that is so long that perhaps we can refer to it as STMSBAGMETR. Oops, and with that we are back to the acronyms!